Thursday, 1 February 2018, 1:27p.m. A woman feared for her life as huge waves swept across a Nelson road and almost smashed her into a bank. 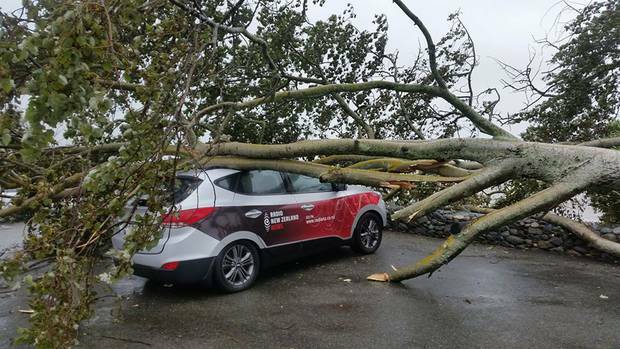 Wild weather is causing chaos across Nelson, where roads are being closed and residents evacuated. One woman's car was almost swept off Rocks Rd. "I called my husband to say goodbye," said Melissa Richards, who was on her way to work from her home on Victoria Rd this morning. "I saw there was no cars on Rocks Rd, which was unusual but I kept going. I went around the first corner and the waves were flying out. I got taken into the bank. The wave just slam dunked across the road." Richards followed a truck out of the chaos but not before calling her husband to say she thought she might not make it. "The police officer said I was very lucky." She was now holed up at work with a whiskey. Rocks Rd (SH6) is now closed to traffic this morning between Bisley Ave and Russell St because of a combination of weather and high tide, which hit at 11.30am. Richmond's Lower Queen St has been closed. Nelson Airport is also closed as the access has been flooded, but it may reopen after the high tide. People whose flights are affected are asked to contact their airline. Police have also cordoned off Mapua Wharf as it was completely underwater. Ruby Bay Rd is also closed. Residents in Mapua have been evacuated as water is breaking over the sea wall. The fire service floated people to dry land using a local's dinghy. "Within 10 minutes it had come over the seawall and completely flooded my property," said Tait St resident Normal Clark. "I don't know what to do now. I shouldn't be crying but I am." Nelson Surf Lifesaving Club have also been called to evacuate residents at Monaco. Nelson Senior Sergeant John Price says traffic is being diverted up Richardson St and they are turning away traffic heading north of Bisley Ave and south towards Tahunanui. Nelson senior station officer Craig Davies has also asked people to stay off the roads until conditions improve, particularly those leading into the city centre. Power was also out in Mapua for about 30 minutes because of bark on the lines, but it has now been restored. Network Tasman operations manager Robert Derks says the power company is "on standby" for any more outages. The council says the closures are likely until 2pm.